Drama about the people and events that inspired Scottish playwright and author JM Barrie to write the classic children's story, Peter Pan. 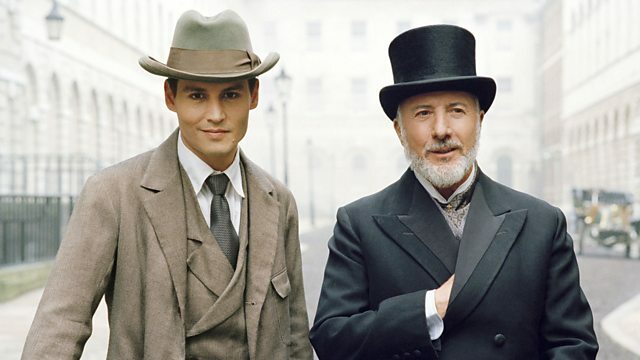 Browse content similar to Finding Neverland. Check below for episodes and series from the same categories and more! Places! Everyone to their places! -Sir Herbert. How are you? -May I give you a peck? One of Mr Barrie's finest? Oh, that genius Scotsman has done it again. It's the best thing I've produced in 25 years. I already have investors interested back in New York. Standing by, please, ladies and gentlemen. If you could take your opening positions, please. Beginners, please take your opening positions. That's great. Thank you. How much longer? I want to dance with your wife at the after-party. It's the best thing that I've produced in 25 years. -Hello, George. How are you? -Healthy and wealthy, I see. You've rearranged a holiday for me. I won't forget it. -Have you got the tickets? -Yes. They're in my pocket. Oh, Mr and Mrs Snow. We were so hoping to speak with your husband before the show. -I'm not sure where he is, actually. We do miss seeing YOU onstage. Well, it's been some time now. Are you right to find your seat? See you at the party, then. and remind him that they're doing his play this evening? Really, I mustn't inconvenience you in this way. -I can wait quite well in the shop. The shop is chilly, and there is a fire here. though I imagine you know that. It's like a dentist's office out there. Why? -I wouldn't say they hate it, sir. -What do you think? Do you like it? -I've just been hired here, sir. -Yes or no? I'm not bothered. Do you like it? Is it crap? -Go on, say it. Just say it. It's shite, isn't it? Go on. Say it. -"It's bull's pizzle, Mr Barrie." -It's bull's pizzle, Mr Barrie. -No, I haven't even seen it. I knew it. Thank you. Thank you very much. Might I look at you, milord, for a moment? And I've seen few other sights. Absolute rubbish from start to finish. -Yes, I found it fearfully dull. -Say goodbye to your investment. Good to see you. My apologies. We'll get them with the next one, Charles. I promise. -Of course we will, James. -I know you put a lot into this one. because I can afford to lose a fortune. -No, I can't. How are you? You were sorely missed at the last club meeting. We were beginning to wonder which is your hobby, writing or cricket. You wanted to speak with Mr Barrie, didn't you? Oh, yes, but we shouldn't interrupt them, should we? If you ask me, the problem lies in our batting order. You remember Mr and Mrs Snow, don't you? So the Snows have been waiting to meet with you all evening. Your play this evening - it was remarkable, wasn't it? That's very kind of you. I'm...I'm glad you liked it. -I think I can do better. I'm headed off for the park, if you'd like to join me. You'll be working, won't you? I'll let you to your work, then. -Have a good day, sir. That's it! Go on, boy! Come on, boy. Come on! Come on, fetch! Excuse me, sir. You're standing on my sleeve. I might point out you're lying under my bench. I have to, I'm afraid. I've been put in the dungeon by the evil Prince George. there isn't much to be done, now, is there? Perhaps I could slide a key to you through the bars. I wouldn't risk it, sir. The evil Prince George has tortured many men. I'm sorry. Is he bothering you, sir? My brother can be an extremely irritating sort of person. Aha, Prince George, I gather. who imprisoned this unfortunate wretch. Not horrible really, but a firm ruler, yes. And what, precisely, has, er... What did you say your name was? -What, precisely, is Michael's crime? -Sorry, lad. Cannot free you. Um, do you mind us playing with your dog? Second in line to the throne. And that one's Michael. -And I'm in prison for it. I'm so sorry. Are my boys bothering you? -We're not bothering him, Mum. Michael, darling, come out from under there. I can't. I'm in prison. JM Barrie. Pleased to meet you. JM Barrie the author? What a pleasure. He's a playwright, Jack. Quite a famous one at that. I apologise. I imagine you're writing. What have you written, Mr Barrie? with my trained bear, Porthos. in exchange for the freedom of this prisoner, of course. while other cowards will force the brute into a muzzle. would attempt these tricks without either measure of safety. What did you bring me over here for? -This is absurd. It's just a dog. Porthos, don't listen to him. and you want to dash those dreams by saying he's "just a dog"? What a horrible, candle-snuffing word. That's like saying, "He can't climb that mountain. He's just a man." Or, "That's not a diamond. It's just a rock." Fine, then. Turn him into a bear. Peter, Where are your manners? With those eyes, my bonny lad, I'm afraid you'd never see it. Thank you. I don't think I've ever seen a performance quite like it. and the bear is always more than happy to perform. Perhaps we'll see you here tomorrow, then. Peter, jump up, please, darling, quick. Peter, didn't you enjoy that? and Porthos simply wasn't a bear at all. I do very much hope to see them tomorrow. Well, I know who she is, of course. Why, she's a du Maurier, for heaven's sake. Her father was the artist. And there was something...tragic that happened with her husband. Cancer of the jaw, I believe. Yes. Apparently, he left her with four boys and no income to speak of. We should have them to dinner. HE CLATTERS CUTLERY Should we? I've always wanted to meet Madam du Maurier. Why, she knows practically everyone there is worth knowing. Oh, nothing of any great consequence. Ever tried your hand at writing a play? Well, then, how do you know? Where's your mother today, and the rest of the boys? Mother's got a bit of a chest cold. I'm sure everyone would be happy to see you, though. I should leave you to your writing. Why didn't you tell me, Charles? You knew it wasn't any good. Why didn't you tell me, James? You knew it wasn't any good. I don't have another play. I need you to sign for the storage, Mr Frohman. -Easy does it. Take your time. You know what happened, James. They changed it. Bang! Bang, bang! Bang, bang! Return the boy to us, you nasty Injun. Our people teach boy Indian ways. Make him great warrior. Our chief, Running Nose, never let him go. Me wounded, Peter. Time short. You go. Spread wings and soar like eagle above enemy. Fly back to our chief. Tell her of my brave defeat! Of course they can. Go on. Go on. Go on. Listen to us, boy. This Indian kidnapped you. Not true. We kidnap no-one. I teach you ways of the brave. I take you as my own son. -Ooh, we are awful, aren't we? First we have a bit of fun for a change! -Stop it, you two! Get off! -Oh, it wasn't your fault. I'm afraid it might have been. To be honest, I'm just happy you got him to join in the game. Oh, yes, I was a tremendous success. Mr Barrie, it's more than I've been able to achieve. Peter's a different boy since his father died. You know, I don't think he's even had a good cry about it. Grief affects us all in different ways, doesn't it? my wife would like to invite you and the boys over to dinner. Well, don't you all look lovely in your little suits? that we've not met until this evening. and seen your name listed among the organisers. if I could just find the time. My problem is, is in finding the time to do everything else. At the moment, I am running two households. Sylvia believes she can get by without a housekeeper. We help her keep the house in order. Don't interrupt, George. Where did you get your manners? I understand you've become playmates of my grandchildren. Oh, they indulge me, really. we took to an exploration of darkest Africa in our garden. But Mr Barrie was taken ill by the bite of a...what was it? Yes, and he swelled to the size of a hippopotamus. We had to float in him down the river like he was a bloated raft. But the fishing was good, wasn't it? -Thank you so much. Very pleasant. Painful. Utterly painful to see. I don't know what you mean. I had a lovely time. "My problem is in finding the time to do everything else." I've never felt so judged in my life. Judged? How do you mean? A grown man, for heaven's sake, playing all day long with children? I hardly think they'll be the social contact we'd hoped for. Hadn't really thought of them that way. Just enjoy their company. He's been a good friend to us, Mother. Yes, but what does that mean, hmm? ..to keep spending your afternoons with those children, do you? -You're going to break it, George. -Just needs a bit more speed. -I want to do it. -Hold off a bit, George. -I think it's in need of a tail. -Here. James, this will do. -No, it's not heavy enough. Porthos. Give us your bell. That's good. Here. -Now, would you like to give it a go? -Oh, he can't run fast enough. -Now, George, you hold the kite. Come on, boys. Let's go back up to the top. Come on. Come on, Peter. All right, George, hold it up. Darling, you've got to run now. Ready? Oh, I told you this wasn't going to work. I don't think he's fast enough. It won't work if no-one believes in him. -Now, give him a chance. -Go back to your starting position. I don't want a flea's breath of doubt. -We must get that kite in the air. I think I feel a bit more breeze. -You can do it, Michael. until I've read them over later. Now, why do you ask that? I think I could tell a whole story about flying the kite today. Perhaps you should, then. That's a fantastic idea. anything TOO serious with this one. No. Talking a bit of silliness, really. Can we have him for supper? Have him to STAY for supper, Michael. We're not cannibals. You are welcome, you know. Mr Barrie. Where have you been? Um, flying a kite, Mother, and having a wonderful time. I'm sorry, I didn't know you were coming this evening. No? Well, apparently you forgot, then. I brought some supper along for us all. Well, there's no food in the house, is there? Really, you don't need to wait till the cupboard is bare. Please, Mother. Come on, darling. Wipe feet. There's been enough tracking round here. take care of the house. Coat, Michael, please. Yes. And...coathanger. -Will we see you tomorrow? No, you are going to be helping round the house tomorrow. Mother, there is absolutely no need for this. You can't do everything yourself. Look at you. You're horribly flush. You're wearing yourself out. Thank you for a lovely day, James. Excuse me, Mother. So, from tomorrow, we're going to have some discipline around here. And not one of you will escape! Perhaps I'll have something later. I've a bit of writing I wanted to do. Are you sure? It was a lovely meal. Sarah let Emma cook this evening. They don't actually have a cook. I take it Mrs Davies enjoyed the meal she had here. I imagine she could use an extra hand now and again, that's all. Perhaps we can send over some of the silver as well. I wouldn't be surprised if some of hers was looking a bit shabby. Maybe she can send over some of the things we've run short on. We rarely see him in this house. That hasn't seemed to bother you for some time now. That sceptre's made of wood. Yes, well, we dream on a budget here, don't we? No, I mean, everyone thinks it's made of gold. But it's just an old hunk of wood. The means to an end, Peter. into the most magnificent gold. "faithfully set forth by Peter Llewelyn Davies." Kipling would swallow his own ear for a title like that. Stab him, George. You can do it. I still have no idea what to write. Write about your family. Write about the talking whale. The one that's trapped in your imagination and desperate to get out. the adventures of the Davies brothers myself. if you would allow me the use of your name for one of the characters. Porthos, that's mine. Let go. I won't go to bed. I won't, I won't. You should have been in bed half an hour ago, young man. I'm afraid I've grown hopelessly lax in my discipline. Nonsense. Young boys should never be sent to bed. They always wake up a day older. And then, before you know it, they're grown. Their father would have been horrified. Of course, he'd never have allowed a dog in the house either. He'd have tied him up in the yard. Right. Last one in bed's a hairy toad. You mean a lot to my boys, you know. It seems to me that Peter is trying to grow up too fast. I lost my elder brother, David, when I was just Peter's age. And it nearly destroyed my mother. Can't imagine losing a child. She didn't get out of bed for months. ..and I went to her. You must have frightened her to death. I think it was the first time she ever actually looked at me. And that was the end of the boy James. I used to say to myself he'd gone to Neverland. I've not spoken about this before to anyone. One day, I'll take you there. Wait a minute, James. He's a fairy? No, he's the irrepressible spirit of youth. Tinker Bell is the fairy. Tinker Bell is a woman? She's not a woman, she's a fairy. James, how does anyone stay young forever? It doesn't work. that it all appears before him, you see? James, I'm your friend. You're coming off a flop. You have a man who is a fairy. -And this girl calls herself Tinker. surrounded by tons and tons of water. -That's a lot of water. -It's a lot of water. Yes, and that's a lot of money. It is, but we can fake the water. Well, if we can fake the water, I'm sure your play will be a hit. You know what I think I'll do? I'll imagine life the way I want it to be. -Long enough and hard enough. And then the money for the play will appear magically before me. -That's right. That's it. Yes. How does the clock wind up inside the crocodile? -Ah, of course he does. and we have to suffer this grave humiliation. Spend a good deal of time with them, don't you? Every moment I can spare, in fact. And Mrs Davies seems to be having a good time of it as well. You should be aware, though, James, what some people have been saying. Mind you, I wouldn't bring it up if I thought the rumours would pass. I'm not surprised. What are they saying? than you do with your own wife. I'm a friend. That's it, nothing more. how you spend your time with those boys and why. How could anyone think something so evil? They're children. They're innocent children. there's always someone who wants to destroy it. No. but I don't think many will give credence to such nonsense. Then why is no-one sitting with them? And they will look for ways to drag you down. to us taking over your cottage for the summer, James? She doesn't go there anymore. Really? It's such a relief to get away. -You'll come and visit, I hope. -Can I drive, Uncle Jim? Out of the way, or I'll make haggis out of you. Get the sheep out the way. I can see the cottage! If you're going outside, don't tear your clothes, please. -Be careful of the stinging nettles. -Would you like to see the rest of it? Thought you could escape from Captain Swarthy, eh? Off to the ship with you, then. Off to the ship, son! or we'll toss you to the sharks. Or maybe the crocodiles, eh? Now, then. Now is your only chance to speak. in your young and soon-to-be-wasted lives. BOY LAUGHS What did you say? What are you doing, son? Are you giggling? On my ship? Giggling? What did you say? -I said, I'm ready, Captain. I'm Curly, the oldest and wisest of the crew. Welcome aboard, Curly. Your job will be to mop the deck. And who be you, young squire? feared by men and greatly desired by the ladies. Welcome aboard, Nibs. You shall polish all wood surfaces. Grab a hold of that rigging. That's not a pirate name. What about Dastardly Jim, eh? Peter shall walk the plank. -What are you playing, again? There's been a mistake here, sir. It says here I'm to play the nanny. Don't imagine I quite fit that part, eh? -You're not actually the nanny. We'll put you in a great big fluffy dog suit. We don't have a Tinker Bell cast, do we? He could play Tinker Bell. Oh, heavens, no. Tinker Bell's a light. It moves around the stage. Just a wee light that moves around the stage. It's a play for puppets. Oh, these names are absurd when you see them all together. It was quite long. I'm exhausted. -Let's get you some tea. Can you come to the playhouse? In a moment, Michael. He's just arrived. But I said, "I'll get him." They always send Peter to do things. I said, "I'll do it. It will spoil the surprise." It's a great surprise. We've taken most of the day preparing for it. Then we mustn't keep them waiting. -Please don't tell them that I told you the surprise. Well, you didn't really tell us anything about it, did you? Yes, I did. It's a play. "'The Lamentable Tale Of Lady Ursula'. "A play in one act by Peter Llewelyn Davies." This is just a bit of silliness, really. I should hope so. Go on. I just wanted to take a stab at writing, you know. Well, the others do a good job of it anyway. Well, let's see it, then. 'The Lamentable Tale of Lady Ursula'. to pray to her blessed saint. came to life and swooped down upon her. and taking her high up into the spires of the cathedral. a young knight named JM Barnaby came into the city. -Do you want some water? Let's get her back to the house. Go on. She won't discuss it with me at all. She claims it was nothing. I tell you, doctor, she couldn't breathe. who won't admit there's anything wrong. You'll have to make her understand that something is. -I'll try and do my best. Put your hand flat like that. Good doctor didn't feel up to the challenge on this one. He thinks you need to go to hospital for further tests. When would I have time for that? Besides, this family's had enough of hospitals. -Perhaps they can help you. -I know what they can do for me. Saw what they did for my husband. No, James. No interest in hospitals. Though I'm keenly interested in having some supper. What did you and Mother decide to tell us this time? It's only a chest cold?! I'm sick of grown-ups lying to me. I'm not lying to you. I don't know what's wrong. "in just a few weeks," and he died the next morning. That wasn't a lie, Peter. That was your mother's hope. but I started planning our fishing trip. I won't! I'm not blind! I won't be made a fool! Darling, I wanted to see the rest of it. Magic's gone out of it a bit now, hasn't it? All because of a silly chest cold. And governments don't really have the right. Well, you remember Gilbert Cannan, don't you? I know how involved you've been as well. He wanted to speak to you. Did think you'd be home so much sooner. -It's been a long evening, Mary. I should perhaps talk to you at another time? We'll talk then. Thank you for your patience, Mrs Barrie. Mr Barrie. Well, aren't you going to speak? "Curious how late Mr Cannan stayed," I suppose. And then, let's see - what comes next? "No later than you were out, James. "And how is Mrs Davies this evening?" Oh, yes, I'd have a great answer for that one, wouldn't I? This isn't one of your plays. But I'm not ready for this conversation, wherever it may lead. Perhaps we can talk in the morning, yes? Goodnight, then. Don't you agree this is a little bit tight? No. No, in fact, I think it's quite...baggy. -I'd bring it right in just there. Right there, and maybe a plank of wood there to straighten him up. -Some wood there in the shoulders. We're just having some tea. -You remember my mother, of course. -Yes, of course. How do you do? Boys, please don't run in the house. You'll break something. Come away from that door. Come on. Come on, come on. I'd like a word with you, Mr Barrie, before you go. We'll only be a few minutes. Boys, why don't you go and play in the garden. Go on! and I know what it's like. Shall we retire into the study? Why don't you join them, dear? -I do apologise for interrupting. -Would you close the door, please? you've offered her the services of your household staff. I'll leave that to Sylvia, of course. You'll leave that to me, Mr Barrie. You see, I'm moving in here from now on. -I'm going where I'm most needed. without resorting to your charity. It isn't charity, Mrs du Maurier. I was only trying to help as a friend. has already cost my daughter? Or are you really that selfish? does for a widow's future prospects? Sylvia needs to find someone. The boys need a father. of pulling itself together again. I have only wanted good things for this family, Mrs du Maurier. I'm suggesting that you protect what you have, Mr Barrie. I was so certain what I would find in this. Some little confession would leak out onto the page. I don't write love notes in my journal. Still, you knew who I meant, didn't you? Means I know you just a little after all. You needn't steal my journal to get to know me, Mary. I suppose I could just go see the plays. I was hopelessly naive when I married you. where good ideas floated around like leaves in autumn. you would take me there with you. It's the best you've written, James. And I'm sure the Davies will adore the world you've created for them. I've wanted you to be. But we moved into this house, and you started... I don't know. You started rearranging the furniture. What was I supposed to do, James? as though I didn't exist. Look, just give me a bit more time to finish up the play. To spend with your muse? No, I'm tired of waiting, James. I'm tired of looking like a fool. Well, I can't very well give up the play. Just come home to me at the end of the day. Rehearse and be home for dinner. No more trips to the country, no more long afternoons in the park. then we must end this. Um, first you get the pyjamas, then you make the bed. You make the bed with your paws. The pyjamas you get with your teeth. you haven't any proper digits, have you? Well, I don't have any teeth either. I mean, I can't see, I can't breathe. All I've got is this rubbery snout. Can we get him some teeth? Let's have a wee break, shall we? -I thought you were wonderful. You're better on four legs than you are on two. -Oh, give it a rest. -Just say it, Charles. Go on. -Well, you picture it, James. all dressed to the nines. But you did know, Charles. -Oh, don't patronise me, James. You know how much money I put into this show I haven't even found yet? Listen, listen. Opening night, I want 25 seats set aside. Scattered throughout the theatre. Two here, two there, three up there. -No, no, no. I'm asking. -The seats are filled. Don't worry. -Asking if they're paid for. -Could I speak to you, please? -It'll be great. It'll be fantastic. -This is great! I'm flying! We don't need to use much pull at all, see? As long as we've got the balance down. Mother asked me to take the boys out for the afternoon. She said she only wanted a bit of quiet. But she was trembling so badly, she couldn't even finish her tea. I'm not a fool, Uncle James. I don't know the truth. She won't talk about it. But you think it's serious? The doctor felt she should go and have some tests. Then you'll have to convince her to go, then. I've tried. She won't listen to me. have come to nothing but harm. Apparently, I've made quite a mess of things. She's run you off, hasn't she? She just doesn't want to see Mother hurt anymore. Somewhere during the last 30 seconds, you've become a grown-up. Right, then. I think you should be the one to talk to her, George. Sorry to interrupt. Um, it's Nana. I think his costume is too tight. George, give me a minute. I'll be back. Yeah, you can have a go if you want. Give that a tug. Go on. -Can I have a go? Can I have a go? -In a minute. In a minute. -Stop mucking about, boys. Come on. -I want to do it! -No! Don't go down there! Oh, no! Oh, no. I'm sorry. Mrs Davies would like a word. You know perfectly well what. unless I submit to an examination. Well, I suppose you'll have to, then. Cos he's quite a stubborn young man when he sets his mind to it. They won't tell me anything different. So you've already spoken to a doctor, then? My understanding is that my condition may be quite serious. However, my wish is that life should go on as normal. So, I'll have the examination. And I'll take whatever medications they advise. But I don't want to know what they're for. And I don't want you inquiring into it any further. Peter, could you help George to fold a pocket handkerchief, please? They're in the linen cupboard. How do you manage to always come untucked? Would you check your shirt tails in the intermission, please? You're not planning on attending any after-theatre events, are you? Only for a short time, if we do. Would you see if George has the tickets, please? Mother, please see if George has the tickets. Michael, where are your socks? Um, wait here. Don't move. We'll need some more blankets. Take Michael with you, would you? She looks much worse than when we were at the cottage. -Those 25 seats. Has anyone shown up? Precisely. Have there been many people asking for seats? I suggest you start selling them. Have you seen any of the Davies family this evening? -The 25 seats, are they filled? Yes, yes. Who did you invite? Because obviously whoever you invited decided not to come. -The seats will be filled, I promise. Have you seen the Davies family this evening? Jack has gone to get Dr Brighton. Oh, no, Mother, I don't need a doctor. I think I'll get some chamomile to help you relax. Peter will be here if you need anything. Can I do anything, Mother? You must go to the play. Yes, you can. I need you to. I need you to come back tonight and tell me every bit of it. It's only a play, Mother. Yes, yes, yes, yes. It's all right. They know. We have time to sell those 25 seats. The play's starting. Forgive them being a bit late. Short legs. Long walk from the orphanage. I'm not clear what they're doing here. -They've come to see the play. 25 seats given to orphans. Right. Now my nightmare is complete. You can start your play now. Get them in the scattered seats. Excuse me, sir. This way. -We have a little gentleman. Looks like we got one of the better dressed ones. I just want you to know, I think you're a wonderful dog. I won't go to bed! I won't! I won't! -Nana, it isn't 6 o'clock yet. One minute more. Nana, I will not be bathed! I tell you, I will not...be...bathed. Yet I feel sure I saw a face. in everything that goes on in this household. -But she'd want to see him! I feel no remorse at excluding you from my home. This isn't your home. It's OUR home. doesn't give you the right to rule over her existence. She's not a child any more. Neither am I. If she wants to see Uncle Jim, she can see Uncle Jim. -Mother, you need to rest! -..I still have things to do here. Four boys. No end of patches. Can't seem to keep up. I haven't the time for all this. Don't look at me like that, James. You make me feel so utterly exposed. Boys, would you give me a moment with your mother, please? They can see it, you know. You can't go on just pretending. You brought pretending into this family, James. by simply believing them to be different. A lot of things, Sylvia. Not everything. But the things that matter. ..you're a part of this family, haven't we? it doesn't matter if it's true. LAUGHTER Oh, I am sweet. and they lift you up in the air. Couldn't you do it very slowly once? Yes, I've got it now, Wendy. I must blow fairy dust on you first. Now try. Try it from the beds. Just wriggle your shoulders like this. And then let go. Second on the right and straight on till morning. -I feel a little better. Oh, it's been a bad day, that's all. I want you to go back to the theatre. You sure there's nothing else I can do for you? I have always wanted to go to Neverland. You did promise to tell me about it, you know. It's a bit late for it tonight, though, I'm afraid. Perhaps some time soon, though. Do you mean we shall both be drowned? Look how the water is rising. It must be the tail of the kite we made for Michael. You remember. It tore itself out of his hands and floated away. -Why shouldn't it carry you? It can't lift two. Michael and Curly tried. I won't go without you, Peter. Let us draw lots which is to stay behind. And you a lady? Never. I've never missed an opening. ..assume you heard about Gilbert and I. Quite the scandal, so I'm told. Without that family, you could never have written anything like this. -I did indeed. Did indeed. You look ten years younger. That was quite the nicest evening I've ever spent in the theatre. Oh, that's very kind of you to say. Thank you. Where's Mr Snow this evening? Oh. I'm afraid he's left us. And he would so have loved this evening. The pirates and the Indians. He was really just a boy himself, you know. I'm terribly sorry. How are you doing? I'm doing well enough now, thank you. I suppose it's all the work of the ticking crocodile, isn't it? Time is chasing after all of us. Mustn't keep you. You've a lot of friends here. Well, it's lovely to see you. -I'm terribly sorry, once again. -Well done, sir. Well done, sir. It's about our summer together, isn't it? -This is Peter Pan! How wonderful. Why, you must be quite the little adventurer. Look, it's true. He has no shadow. But I'm not Peter Pan. Has James been by at all today, Mother? You haven't been keeping him from me, have you? As a matter of fact, I actually hoped he might come. Would have proved me wrong about him. the whole of London must be knocking at his door. Mother, could you come downstairs for a moment? Of course she can't come downstairs. What are you thinking of, George? Actually, I think a trip downstairs might do her good, ma'am. It's not just A play, Michael. Of course, we'll have to make do with a few compromises. Much of it will have to be imagined. -As it should be. That's right. Michael, come and sit here, next to Mum. -I won't go to bed. I won't. I won't! Nana, it isn't 6 o'clock yet. But they're nearly all dead now. its first laugh becomes a fairy. So there ought to be one fairy for every boy and girl. -Ought to be? Isn't there? Children know such a lot now. Soon they don't believe in fairies. And every time a child says, "I don't believe in fairies,"
there's a fairy somewhere that falls down dead! Wendy and the boys captured by the pirates? I'll rescue her. I'll rescue her! Oh, that's just my medicine. Who could have poisoned it? And you drank it to save my life? Her light is growing faint. If it goes out, that means she's dead. Her voice is so low, I can scarcely hear what she's saying. if children believed in fairies. If you believe, clap your hands. I really began to believe we'd go on like that forever. She wasn't going to stay with you forever. She had a husband - my father. She never cared for you the way she did for him. I'm not trying to replace your father, Peter. You'd best let him go. George, would you take the boys back to the house? I'll be with you in a moment. Go on, dear. I've ruined everything I've touched in this family. Stop giving yourself so much credit. Peter's grieving. It has nothing to do with you. Perhaps if I just had a bit more time with him. No, Mr Barrie. That won't be good enough. but I loved your daughter very much. And I love those boys. And I think they need me right now. And for how long after? And what do you have to say about that? I shall respect my daughter's wishes. Something I should have done more of while she was alive. I assure you I can certainly look after the boys by myself. Do you think I could abandon those boys? Mother pasted it back together. And then I saw the play. and I haven't been able to stop. She would be very pleased to know that. I'm sorry I was so horrible. ..I thought she'd always be here. You'll always have her there. Always. But why did she have to die? about her boys that never grew up. if you just go there yourself. London, 1903. After his latest play flops, JM Barrie finds distraction when he befriends the Llewelyn Davies family - four young boys and their widowed mother Sylvia. His relationship with them threatens his marriage and standing in society, but results in the creation of Peter Pan. Drama inspired by actual events.